The Red Bull brand is one that has created headlines in the football world since the creation of RB Leipzig and their ascent towards the top end of the Bundesliga. Before Leipzig though another city in Central Europe provided the blueprint for the brands playing and recruitment model. When Austria Salzburg were bought over by the Red Bull group in April 2005 there was resistance from fans of the club who saw it as a move to strip them of their identity as a football club. Fast forward 12 years however and that resistance has for the most part fallen away in the wake of domestic success in Salzburg. This season saw the appointment as head coach of Marco Rose, the coach who had led the clubs youth team to an unlikely and impressive victory in the Uefa Youth League the season before. Rose fits with the model of the club almost perfectly choosing to dominate the ball via quick transitions from defence to attack that unsettle the opposition. Whilst the 4-2-4 of Roger Schmidt and the intense pressing of Ralf Ragnick are not completely adapted in the game model used by Rose there are enough elements of both remaining to clearly identify the ethos of the club. This season has seen Salzburg struggle to an extent to cope with the dual commitments of the Europa League and the Austrian Bundesliga. They currently sit second in the table behind Sturm Graz although with over half of the season still to play I would expect their greater depth and quality to tell over the remainder of the year. This match saw SC Rheindorf Altach travel to the Red Bull Arena for in important league match. This season under Rose we have seen RB Salzburg play a variant of a 4-4-2 with a diamond in the midfield, the position of the holding midfielder within the structure is constant whilst the three other midfielders are more fluid in their positioning and movement. Cican Stankovic started in goal for the home side behind the back four of Andreas Ulmer, Duje Caleta-Car, Jerome Onguene and Stefan Lainer. The Malian midfielder Diadie Samassekou has made the holding midfielder role his own this season. He was flanked by Amadou Haidara and Valon Berisha with Hannes Wolf as the point of the attacking diamond. Munas Dabbur and Fredrik Gulbrandsen played together in attack. Altach played a 4-1-4-1 system with Martin Kobras behind a back four of Benedikt Zech, Emanuel Schreiner, Phillip Netzer and Valentino Mueller. Christian Gebauer was the holding midfielder along with Jan Zwischenbrugger, Kristjan Dobras, Matias Honsak and Patrick Salomon. Bernard Tekpetey was the lone striker. Diadie Samassekou is a 21 year old Malian midfielder who has already been capped at full international level. Having initially came in to the Red Bull system in 2015 he spent some time with the affiliate club Liefering before cementing his position as a first team player for Salzburg this season. In the system favoured by Marco Rose Samassekou is responsible for providing the pivot around which the rest of the team moves. He is constantly making small movements to ensure that he is open and available to take possession from the man with the ball. Salzburg use elements of La Salida Lavolpiana as a tactical concept, this is simply where a central midfielder drops deep to split the two central defenders and form a back three to enable the progression of the ball out from the back, in this concept the versatility and ability on the ball from Samassekou is key. Here we see Salzburg building from the back as Altach are in a medium block with relatively little pressure on the ball. 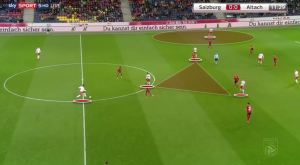 In this situation Samassekou has two options with which to support the man in possession, in a positional play model he would drop behind the line of pressure from the Altach midfield to allow the ball to be played though in to space. In this match however his tendency was to move in front of the Altach pressure to either split the defenders and move them wide or to take the ball in front of pressure before moving the ball out wide. As you can see the movement from Samassekou is minimal in terms of distance covered but effective in allowing the ball to be progressed. Once again here we see Salzburg looking to progress the ball and move forward in to the Altach half of the field. With only one opposition player moving in to a position to apply pressure to the ball. This time Samassekou has already dropped in to a deeper position and as you can see the two central defenders have responded by moving out in to the wider areas. On this occasion the first pass out of the defence does not go straight to the Malian midfielder but instead in to the midfield in front of the midfield line of Altach. Instead of then building from an advanced position however the ball is immediately bounced back to Samassekou who has space to move the ball forward to attack from a different vertical channel, thus forcing the Altach defensive block to have to adjust and cover the opposite side of the field. With Haidara and Berisha playing in a more central area, or indeed in the half space for Salzburg there was a need for the fullbacks to advance where possible to provide the width to stretch the Altach defensive structure. This was more noticeable on the left hand side than on the right with Stefan Lainer providing an excellent attacking outlet throughout this match. In playing a midfield diamond in the manner that we saw from Salzburg you immediately force your opponent to adopt a more narrow defensive structure as they look to remain compact around your attacking shape. This in turn of course creates wide open spaces in the wide areas that can be exploited by fullbacks running from deeper spaces. Here we see Salzburg once again building from the back and looking to progress the ball forwards. Three of the four central midfielders in the diamond are shown in relatively narrow positions towards the attacking third for the home team. As stated above this in turn leads to an opportunity for Salzburg to exploit the space in the wide areas. In this instance the ball is a fairly direct diagonal pass that misses out the centre of the pitch and looks to catch the Altach defenders out. The pass is completed and Salzburg have an opportunity to penetrate the corner of the Altach penalty area. Again we see the narrow midfield shape from Salzburg has effectively collapsed the centre of the Altach defensive structure and the away side appear to be in an ineffective structure. With Samassekou in comfortable possession of the ball inside the opposition half he has plenty of time to assess the options open to him. In the end he attempts and completes the most difficult of these options with a low driven pass that dissects the Altach defensive line and finds the left full back running in to space right on the edge of the opposition penalty area. By playing with two forwards from the start in the 4-diamond-2 system Salzburg immediately give themselves the opportunity to overload and effectively overwhelm the opposition in the final third. Couple these two strikers with three central midfielders given licence to advance forward and fullbacks on either side providing width and we immediately begin to realise the problems that faced the Altach defence in this match. Here we have the man in possession of the ball moving in towards the Altach defensive line, a defensive line that is narrow and compact but not well positioned in the slightest. Immediately there four passing angles open, all of which would allow Salzburg to progress the ball in to attacking areas. In the end the ball chosen is the most attacking one as the ball is slipped through the defensive line for the striker to run on to. With the ball on the edge of the Altach penalty area we see four Salzburg players moving in to attacking positions centrally. They have effectively collapsed the centre of the Altach defensive structure with six players being responsible for four attackers. This creates space elsewhere on the field which can then be exploited by Salzburg, as we can see in this example as the ball is cut back to Haidara who is moving forward in to space at the edge of the opposition penalty area. Having watched all but one of the Red Bull Salzburg matches so far this season I can say with some confidence that they have played better than they did in this match. They were still by far the dominant side although a 2-0 scoreline does not necessarily reflect that dominance. Salzburg have rotated their attacking options this season with Dabbur in particular impressing with the quality and variety of his finishing. In Samassekou and his Malian compatriot Amadou Haidara they have two of the most talented young players in the country patrolling their midfield, with these resources and with the financial status of the club allowing them to build genuine squad depth we should see the domestic league title going to Salzburg at the end of the season.